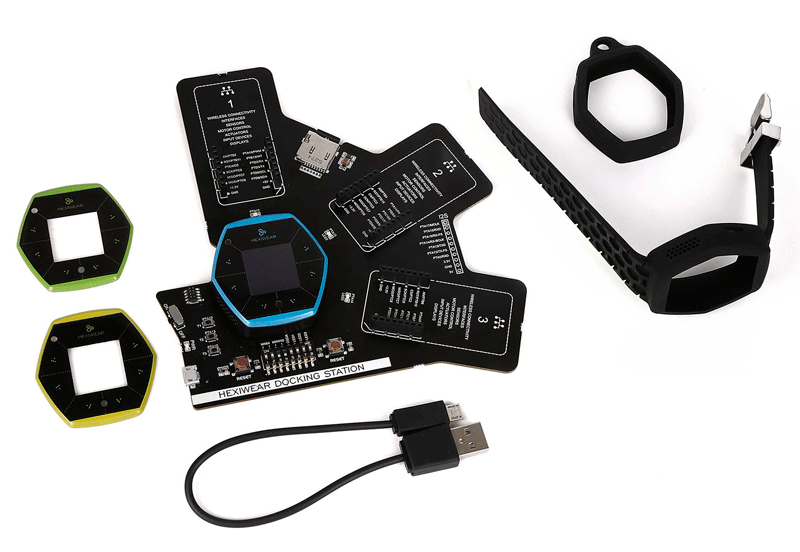 When Hexiwear launched its Kickstarter campaign we read "Hexiwear is a wearable development kit for the Internet of Things era. A small and sleek, low-power device packed with sensors to quantify yourself and the world around you. Wirelessly enabled, it can connect both to devices nearby or to cloud servers far away." Hexiwear is the fruit of a collaboration between MikroElektronika and NXP, and has met with a lot of enthusiasm. 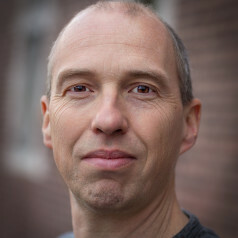 Unlike most MikroElektronika products, Hexiwear is completely open source. The Hexiwear Power User Pack comprises two boxes. 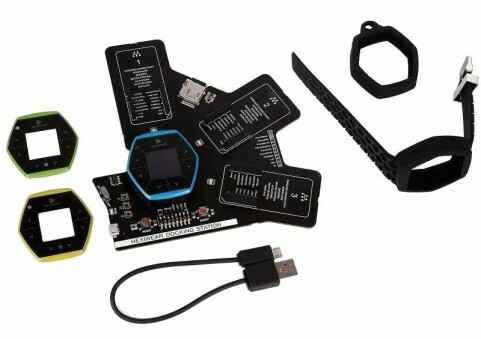 The first one contains the hexagonal Hexiwear module plus a black wristband (which is a a tad on the short side), a black soft cover to use the Hexiwear on a hanger or as a key chain, and two extra front masks (top glasses) in yellow and green. 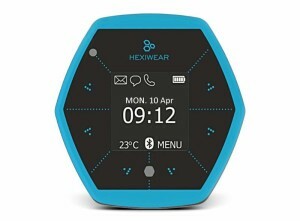 The Hexiwear itself is black & blue. In the second box lies a wildly shaped base board — the Hexiwear Docking Station — and a short USB cable. What struck me is that everything looks nice, from packaging to hardware (even the USB cable looks nice, but a bit short), it is clear that a lot of care and attention went into the development of this product. Very inviting, you immediately want to do something with it.